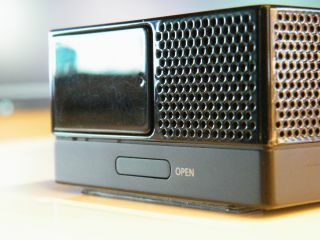 Samsung has been coy about the release of its H03 pico projector. TechRadar first locked eyes on the diminutive device back in CES 2010. Even though this was in January, the company didn't disclose the name to us – instead just let us hold it and look at it in awe. At its European conference earlier this week, we finally found out that it's called the Samsung H03 pico projector and it also comes in black. The Ho3 offers up 30 ANSI lumens of brightness and is equipped with a USB port and a microSD card slot. The bulb inside the projector will last a whopping 30,000 hours and you will be able to use the H03 for two hours before you have to charge it up. Perfect then for those who want to show off a variety of documents but don't want to lug around a laptop and a projector. You won't need the laptop if you are showing off Office documents, as the projector has this software built inside. It will also project any PDFs you have as well. The H03 pico fits directly in your hand and ways a mere 200 grams. Other connections on the device include PC/Composite and whole there is some internal storage, we reckon you will want to use the microSD if you are thinking of storing movies on the device. We're still no cleared to a UK release date for the Samsung H03 but as it was shown off in Europe, at least we know it will be coming to the UK market – hopefully sometime this spring.